San Francisco, CA, August 17, 2016: While consumer adoption and use of mobile wallets continues to rise, both in dollar volume and total new users, mean monthly mobile wallet use has dipped 20% in the past three years. Most mobile wallet providers, in particular the three major “Pays” — Apple Pay, Android Pay, and Samsung Pay — are failing to show consumers clear reasons to reach for their phones instead of their credit or debit cards. 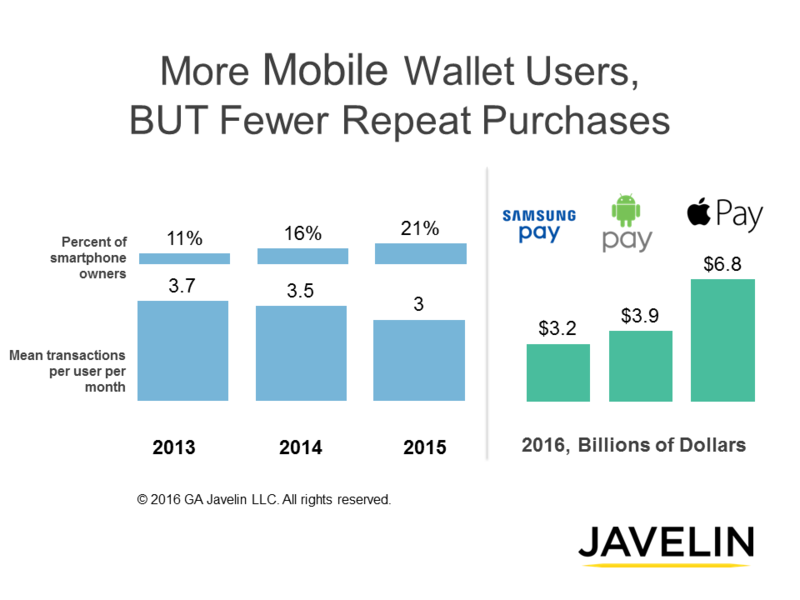 Today, Javelin Strategy & Research released, Merchant, Bank Mobile Wallets Prove Value Where Apple, Google, Samsung Have Not, which explores how the major Pays stack up and recommends strategies to drive repeat purchasing behavior by creating value all along the purchase journey, not just at the point of payment. Monthly consumer adoption of mobile wallets (including those offered by merchants, card issuers, and the “Pays”) has nearly doubled in three years from 11% to 21%. However, monthly frequency of wallet purchases per person has declined from 3.7 transactions per month in 2013 to 3 transactions in 2015, a 20% decline in purchases per person. Providers are attracting first-time mobile wallet users but failing to demonstrate clear value that drives repeat purchasing behavior. The lack of clear consumer value has constrained adoption of the Pays for in-store purchases, with just 3% of consumers having used Samsung Pay in the past month in 2016, 5% using Android Pay, and 8% turning to Apple Pay. The challenge facing wallet providers to create value that drives repeat purchasing behavior is significant—mobile wallet use as a substitute for pulling out a plastic payment card is perceived by consumers as an unnecessary extra step. The report, Merchant, Bank Mobile Wallets Prove Value Where Apple, Google, Samsung Have Not, highlights how merchant and bank wallet providers are creating additional value, enhancing the experience in ways that plastic payment cards cannot. 2015 Gang of Five: Apple Pay vs. Android Pay vs. Samsung Pay vs. PayPal "Pay"?